My man and I celebrate our anniversary this month by escaping to Carmel-by-the-Sea, “a seaside town…in the pine forest.” Romantic sounding, yes? But to add even more romance, we decide to bring Henry, the dog. Not entirely our idea at first. A good friend recommends that we stay at “Doris Day’s place” right in the center of town. Doris, as many of you may know (well, I suppose only those 50 and over are familiar with the sweet actress…) is a huge animal lover and protector, so only makes sense that she owns a lovely old inn in an upscale village that encourages visitors to bring their furry friends. We realize that this is someplace different immediately upon arrival, when the doorman pets Henry, welcomes us (yes, in that order), and asks if we need a refrigerator for Henry’s special diet needs. “Umm, no,” we respond, unsure of what diet he’s talking about. Do some dogs arrive while on the Atkins Diet, or more appropriately perhaps, the South Beach Diet? Later, we realize our ignorance. Henry is escorted genteelly to our room on leash by a porter, and then given his own water bowl and soft fluffy dog bed. My man and I glance from Henry’s bed to ours, and fleetingly wonder which one is most comfortable. 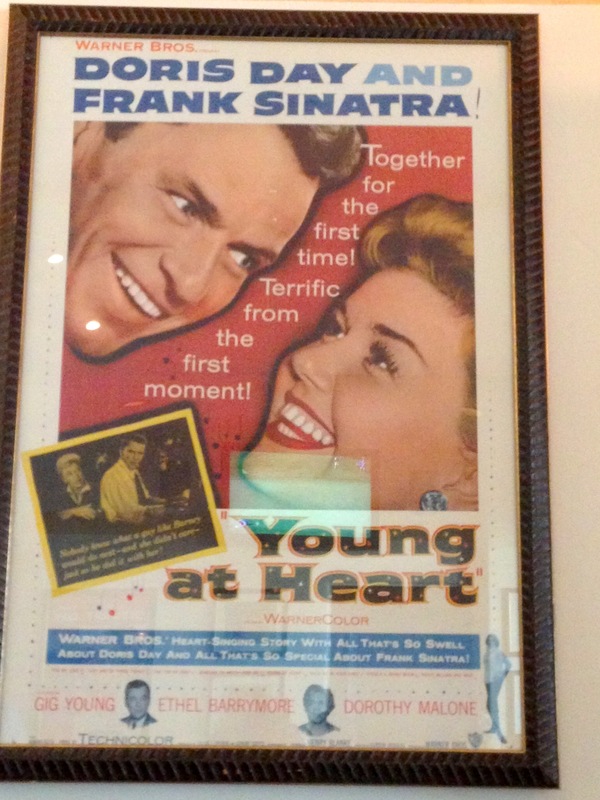 Soon after, we stroll down to the leather-chaired bar, full of Doris Day movie posters and memorabilia. One of her 1950s movies streams continuously on the walled flat-screened T.V., and I’m tempted to watch it as I sip my microbrewed beer, but honestly, the scene right next to me is much more enticing. 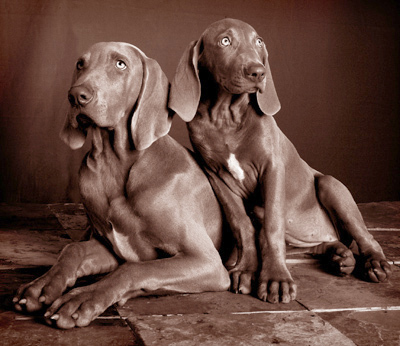 I spy a mother-daughter couple coast in with their two Weimaraners, as sleek and lovely as their owners. I squeeze my eyes shut, hoping they don’t take the empty table next to ours. I’m not an unfriendly sort, but by the look of their expensive face lifts and haute couture clothes, I don’t think we’ll have much in common. Au contraire. The pair from L.A. can’t be more friendly as they discuss their rescued dogs (2 years and 5 years old), their special diet (raw only – ohhh, thus the need for refrigeration), and their routine of baking a fresh pumpkin, weekly, to help their dogs’ joints. Over the top? Yes, in my opinion, but honestly, these people just love their animals and want them healthy and happy. The neatest part is that in the smallish bar, with two goldens, two weimaraners , a standard poodle, and the largest brown lab I’ve ever seen, as well as their humans, everyone gets along famously. No growls, no barks, just a sniff here and there, and then a few contented sighs as the dogs sit by their best friend’s side. All in all, the weekend is marvelous fun, and Henry is extremely grateful that we’ve brought him along (plus he loves the special treats waiting for him each time we pass the reception desk). When we leave, my guy notes that, really, this is an Inn for Dogs, in which their humans are allowed to stay also. Pam–a perfectly charming piece! Makes me want to run out and buy a dog. We’ve been dogless for 9 years now. But alas! We travel too much and not everyone is accommodating as Doris. My daughter will be arriving shortly with her dog and our island community has lots of dogs…so we will enjoy them. Thank you for sharing. Such a delightful story. Thanks for reading about our doggy get away. I still say there should be a ‘weekend’ or ‘week’ adoption program where dog lovers can take care of a friends/acquaintances dogs and get their dog fix. Oh, Henry was very good at giving us our ‘privacy.’ He’s very astute, as most dogs are. But I must admit, he got most of the attention on this weekend – fellow dog lovers oohed and ahhed about how good he looks in his ‘elder’ years. Sounds like a great place—lucky dogs :-)! Truly. 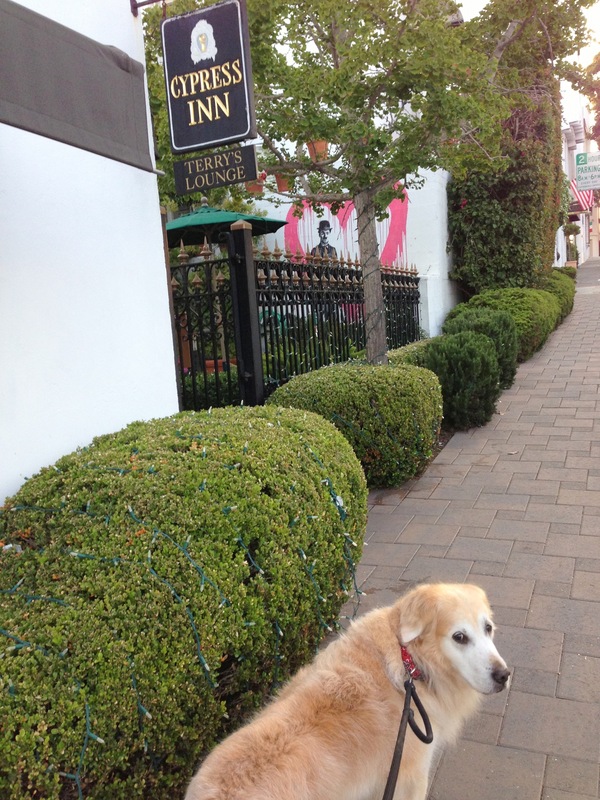 I must say, when we drove cross country a few years ago to move from one coast to the other and stayed at ‘dog friendly’ motels across this nation, none of them quite spoiled the dogs as Doris Day’s special inn does. It makes me want to borrow a dog and go! I have always loved Doris Day as a big band singer (my Dad was a big band lover), actress and champion of animals! It makes me like her even more knowing she would dream up this wonderful retreat for dogs and their humans. How did you learn of it? 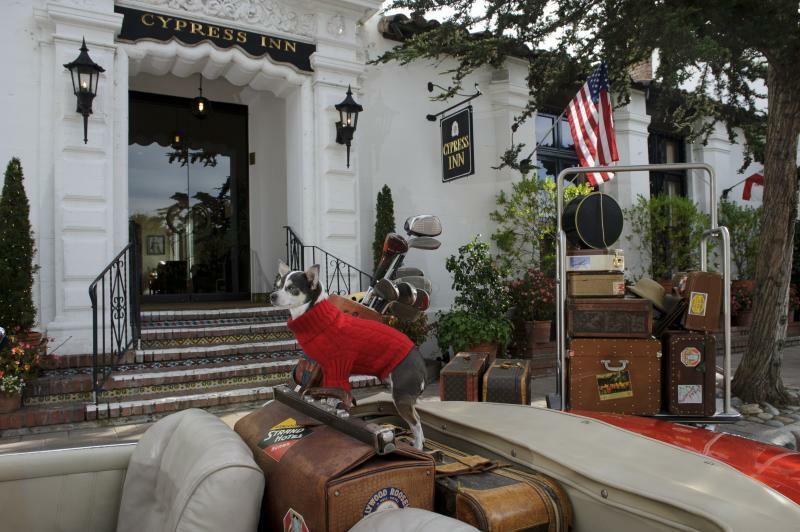 The Cypress Inn is pretty famous in these parts. CA is a dog-loving state for sure. The town of Carmel is one part human to two parts dog – every resident seems to include a furry being as part of their family. Wow! 50’s movies and dog treats?? What a find! Thanks for the tip, Pam. We’re taking Arthur and Guinevere next time we’re in CA! You should make an Arthur movie with Doris Day in it (!) – or at least her Inn. I have never heard of this place. Makes me wish I had a dog! And what a cool place, to take such an interest in the pets. It’s wonderful that they (the dogs) got along so well. I guess it depends on where they stay as to what their behavior is! 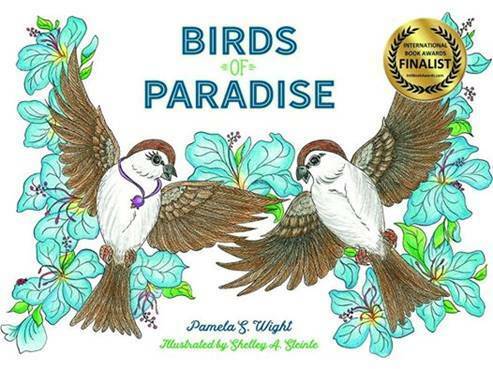 Wonderful post, Pamela. Happy Anniversary. I think that when the humans are cool and calm, the dogs are too. Training helps a lot, too, though. As it should be. All is right with the world that caters to our doggie friends. So, do you think a Horse Inn would make it… at least up in your neck of the woods? Ah, the good old days with Doris Day and Rock Hudson! All I can say is Henry is one lucky dog! Happy Anniversary to you!!! Thank you. And you know what? We are two lucky humans, who have each other (and Henry) in our lives. Lovely post Pam – even though I dislike dogs and the feeling’s mutual. I think it’s great for dogs and their owners to be especially prioritised – there are plenty of joints for other folk. I’d love to meet Doris Day though – I presume she doesn’t hang around the bar singing ‘Windy City’? Although we looked out for any Doris Day sightings, we had no luck. Her presence is definitely felt in that Inn, though, and many of the ‘regulars’ who stop by at the bar seem to know her, and her work, well. Oh how funny! An inn revolving around the furry ones. Only secondly catering to the ones who are paying. 🙂 Actually, our lives have revolved around furry ones lately too. The kids both adopted kitties a few weeks ago. We get daily updates from one of the children as to how the kitty is doing. The kitty is sleeping two inches from her face each night. She is in love! We roll our eyes and smile. Sorta like how college caters to the students, even though it’s the parents who are paying!! I didn’t see any kitties around at that Inn, so not sure your ‘kids’ could bring their new treasures to Carmel-by-the-Sea. But your son and daughter are so in love now with their new ‘babies,’ they probably wouldn’t want to! It’s fun, and funny, isn’t it? How cool is this!? I think I’d love to go there and take Le Chiweenie. Only, I don’t think I would on my anniversary. LOL. Le Chiweenie would be sooo happy with you if you took her to Doris’ special doggy hotel. Henry was very understanding that this was a special weekend for US, too, and gave us our space when needed. I just realized that “congrats” isn’t what you say for anniversaries. What do you say thought? “And many more…” ?? I love Doris Day. What a fun tale of doggie delight. Our three large dogs would have a blast but I’m not sure the flight or drive from NC to Cali would be much fun for us two legs.